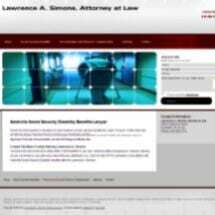 Lawrence A. Simons, Attorney at Law, is a Christian law firm in Nashville, Tennessee. Founding attorney Lawrence A. Simons has more than 27 years of litigation and trial experience. We litigate cases aggressively but ethically. We believe that success is achieved by competence, persistence and hard work. Social Security Disability: We represent people who have their claims for Social Security Disability and SSI denied. Personal injury: We represent people injured in auto accidents, slip-and-fall accidents, and other types of negligence claims. Family law: We handle legal issues involving your family, including divorce, child custody, child support, marital property division, modifications, visitations and fathers rights. Criminal defense: We represent people charged with all types of crimes, including DUI/DWI, drug crimes and assault. Wills: We draft wills, trusts, powers of attorney and living wills to reflect your wishes and protect your beneficiaries. Our law office is located in the Green Hills Area in Nashville. Call 615-983-6936 to schedule a free initial consultation. 9:00 a.m. to 5:00 p.m., C.S.T. John B. Link, III, Esq. Social Security Disability is designed to help disabled workers get the benefits they need. However, it often takes the assistance of an experienced lawyer to help you navigate the system. If you've been injured in an accident occurring on or off the job, you may have concerns about whether the insurance company on the other side will treat you fairly. Mr. Simons is a trial lawyer with 26 years litigation and trial experience. Success is achieved for clients by competence, persistence and hard work. Cases are litigated aggressively, but ethically. At the law office of Lawrence A. Simons, Attorney at Law, we will be by your side every step of the way, fighting for you. Call 615-386-7074 to schedule a consultation with Nashville attorney Lawrence A. Simons.